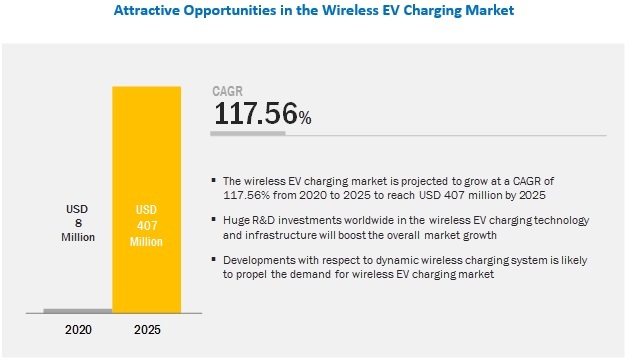 [173 Pages Report] The wireless EV charging market is estimated to be USD 8 million in 2020 and is projected to reach USD 407 million by 2025, at a CAGR of 117.56% during the forecast period. Increasing focus on R&D activities and rapid technological changes owing to the changing government norms for emissions are projected to drive the wireless EV charging market. The BEV segment is expected to be the fastest growing wireless EV charging market, by propulsion, during the forecast period. Due to strict emission norms introduced by governments in various countries and an increase in the distance traveled by EVs, the BEVs are anticipated to increase in the coming years. In addition, the governments of some countries have begun providing subsidies for environment-friendly cars, thereby encouraging the use of BEVs. Moreover, OEMs are focusing on the BEVs due to the stringent government regulations to curb rising emissions. Increasing BEV sales and government support for BEVs are likely to propel the overall market. The stationary charging is expected to be the largest contributor in the wireless EV charging market, by charging type, during the forecast period. The stationary wireless charging system is a convenient, safe, and reliable technology. This technology is interoperable as drivers can charge their vehicles with any wireless charging system. Also, vehicles can be charged in the parking spot and public places wirelessly. The stationary wireless charging system is also contributing to the expansion of the charging networks for EVs. Many companies have introduced stationary wireless charging systems. For instance, Evatran (Plugless) has introduced a stationary wireless charging system for Nissan Leaf and Chevrolet Volt. Asia Pacific is expected to account for the largest market size during the forecast period. The Asia Pacific region comprises the emerging economies such as China and India, along with the developed nations such as Japan, and is the largest market for automobiles. Well developed and extensive charging infrastructure is provided by the governments in this region. In many countries in Asia Pacific, the governments have provided various incentives in the form of subsidies and tax exemptions to increase the adoption of EVs. Furthermore, the governments of the region’s developing countries such as India and China are formulating favorable policies and offering subsidies to the European and American OEMs to set up their manufacturing hubs in their countries. Asia Pacific is the fastest growing wireless EV charging market globally. Technological advancements have led major OEMs to incorporate advanced and convenience features such as wireless charging system in their EVs. Due to the availability of cheap labor and favorable government policies, mass production of EVs is also possible, resulting in a lower price of such systems in the near future. The implementation of new technologies, the establishment of additional manufacturing plants, and the creation of value-added supply chains between manufacturers and material providers have made the Asia Pacific region a market with immense growth potential. The major players in the market include WiTricity Corporation (US), Evatran Group (Plugless) (US), Momentum Dynamics Corporation (US), Qualcomm Technologies, Inc. (US), Bombardier, Inc. (Canada), ELIX Wireless (Canada), Continental AG (Germany), and Bosch (Germany). Qualcomm is anticipated to be a dominant player in the wireless EV charging market. It adopted the strategies of new product development, partnership, and merger & acquisition to retain its leading position in the wireless EV charging market. Strengthening the product portfolio and global presence by building customer relationships, Qualcomm has developed a dynamic wireless charging project funded by the European Commission. This is the strategy that Qualcomm is following to maintain its leadership in this market. In 2018, GoMentum Station and ELIX announced a partnership that will facilitate the testing of ELIX’s patented MDC wireless power system, enabling autonomous EVs to charge themselves without human intervention. ELIX will become the official wireless charging supplier to GoMentum Station, beginning with the installation of an ELIX wireless charging unit at GoMentum Station’s 5,000-acre test facility for active use by testing partners. In 2017, WiTricity collaborated with Texas Instruments to use automotive-grade semiconductor components in WiTricity’s DRIVE 11 wireless charging systems and reference designs. DRIVE 11 wireless charging system enables drivers to park their EVs and be assured of rapid, efficient charging without having to handle charging cables. WiTricity’s TMN Controller utilizing TI’s C2000TM real-time control microcontroller (MCU) can enable DRIVE 11-based EVs and charging stations to automatically optimize energy transfer between the source and vehicle in a wide range of real-world operating conditions including parking misalignment, differing vehicle ground clearance, and varying battery voltage conditions. In May 2017, Qualcomm, Inc., through its subsidiary Qualcomm Technologies, Inc., launched Dynamic EV Charging (DEVC). This enables the charging process while driving and can charge the vehicle up to 20 kW. With this system, two vehicles travelling in opposite directions on the same route can be charged simultaneously. Qualcomm Halo will further be tested by VEDECOM (Research Institute) for FABRIC, a USD 10.61 billion project funded by the European Commission to test the technological feasibility. How is the increasing adoption of electric vehicles and changing environmental norms affecting the wireless EV charging market? How does dynamic charging work? How will the advent of autonomous vehicles impact the market? 16.7 Hella KGaA Hueck & Co.
16.13.1.6 Leviton Manufacturing Co., Inc. The study involves 4 main activities to estimate the current size of the wireless EV charging market. Exhaustive secondary research was done to collect information on the market such as the use of wireless EV charging technology in vehicles. The next step was to validate these findings, assumptions, and market analysis with industry experts across value chains through primary research. Both top-down and bottom-up approaches were employed to estimate the complete market size of different segments considered in this study. The secondary sources referred to in this research study include automotive industry organizations such as the European Automobile Manufacturers’ Association (ACEA), Electric Vehicle Association of Asia Pacific (EVAAP), corporate filings (such as annual reports, investor presentations, and financial statements); and trade, business, and automotive associations. Secondary data has been collected and analyzed to arrive at the overall market size, which is further validated by primary research. Extensive primary research has been conducted after acquiring an understanding of the wireless EV charging market scenario through secondary research. Several primary interviews have been conducted with market experts from both the demand-side vehicle manufacturers [(in terms of component supply) country-level government associations and trade associations] and supply-side manufacturers (wireless charging system manufacturers and distributors) across 4 major regions, namely, North America, Europe, Asia Pacific, and the Rest of the World (Brazil and South Africa). Primary data has been collected through questionnaires, emails, and telephonic interviews. In the canvassing of primaries, we have strived to cover various departments within organizations, such as sales, operations, and administration, to provide a holistic viewpoint in our report. After interacting with the industry participants, we conducted brief sessions with highly experienced independent consultants to reinforce the findings from our primaries. This, along with the opinions of the in-house subject-matter experts, led us to the findings as described in this report. Both bottom-up and top-down approaches have been used to estimate and validate the size of the wireless EV charging market. In these approaches, the vehicle sales statistics for each vehicle type (passenger vehicles and commercial vehicles) at the country level have been taken into account. To determine the size of the wireless EV charging market, in terms of volume, the EV sales numbers have been multiplied by the country-level penetration of each technology/segment considered in the study. The country-level market size, in terms of volume, of the wireless EV charging system is then multiplied by the Average OE Price (AOP) of each system. This provides the country-level market size, in terms of value. The summation of the country-level market size gives the regional market size, and further summation of the regional market provides the wireless EV charging market size. All percentage shares, splits, and breakdowns have been determined using secondary sources and verified by primary sources. All parameters that are said to affect the markets covered in this research study have been accounted for, viewed in extensive detail, and analyzed to obtain the final quantitative and qualitative data. This data has been consolidated, enhanced with detailed inputs and analysis from MarketsandMarkets, and presented in the report. The data was triangulated by studying various factors and trends from both the demand and supply sides in the wireless EV charging market. 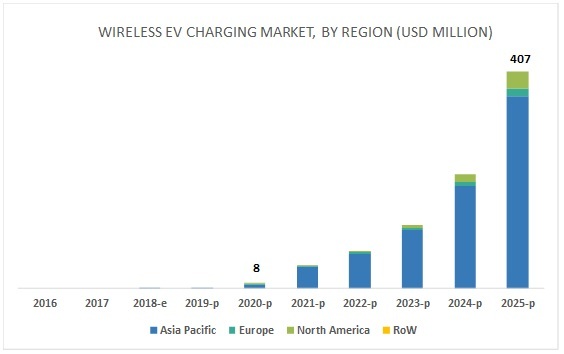 To segment the wireless EV charging market and forecast the market size, by volume and value, based on power supply range 3–<11 kW, 11–50 kW, and > 50 kW. WiTricity Corporation, Evatran Group (Plugless), Momentum Dynamics Corporation, Qualcomm Technologies, Inc., Bombardier, Inc. 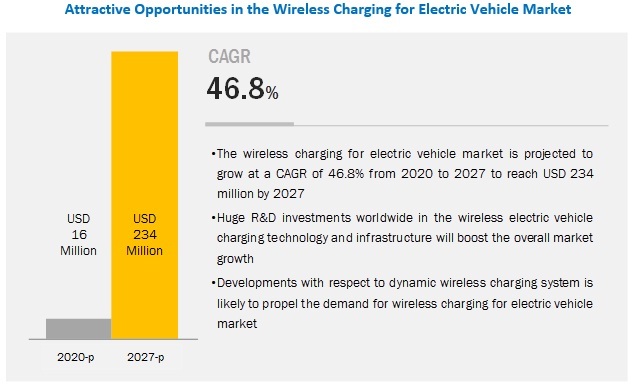 This research report categorizes the wireless EV charging market on the basis of charging station, charging type, installation, propulsion, component, vehicle, power supply, and region. With the given market data, MarketsandMarkets offers customizations in accordance with company-specific needs.